At Halloween parties I always have an area dedicated to "keeping the children amused" so the adults can enjoy a quite, or not so quite drink. This year was a vampire theme so we created a Vampire Blood donation room. This had children dressed in bloody white coats taking blood donations from a group of happy donors. A small set of printable items have been developed for this game. The Blood Donation room had lots of small bottles of blood (coloured water), blood bags, bloody bandages, syringes, white coats, face masks and bandaids. Finally we included a reclining chair for the victims. We used a very old dresser as the counter for our blood collections, and a large black candelabra to hold the blood bags, the blood bags are easy to find on-line. The decorations included a mix of vintage pieces including silver, glassware and bottles and modern halloween props. Our young victims patiently waited their turn before being subjected to the blood drawing. We developed a small set of printable items for the party, the waiting room had a sign, queue number and small circles for blood types. The blood drawing room had small cards for the blood drawers to complete. We found some blood syringe pens on-line. This printable set is available in our shop. We collected a lot of small bottles for this party, they were filled with water and red food dye to look like very dark blood. Syringes are easy to find on line. We included some small tweases and lots of bandaids in a vintage silver and glass serving dish. The dressing table had lots of small shelves that were decorated with a few modern halloween pieces. This was a great game for a vampire party and many an adult ventured into the blood donation room to emerge with a few artfully applied bandaids. You may also like our other Vampire Posts: Vampire Dessert Table and Gothic Vampire Party. The printable items we used for this party are available from our shop. What more could a young and young at heart Vampire want from halloween than a halloween Vampire Party with a Vampire dessert table laden with Dracula Cake Pops, Castle Cup Cakes, Blood Jelly and Coffin and Bat Vanilla cookies. We trust you will enjoy our Halloween Vampire Dessert Table. I positioned the bats to look like they had just left their roost for the night, soaring across the night sky in search of victims. The moon worked well as a centrepiece. Coffin Vanilla Cookies and Bat Vanilla Cookies worked well for a vampire theme. They were simply decorated in red or black icing with small silver and gold cachous to add definition and sparkle. We made Dracula cake pops for the party and used a combination of large and small cake papers to make capes. The cake pops were placed in styrofoam that was covered with small bones and bats and wrapped in a castle printable from our Vampire Dessert table package. We served Blood Jelly in LED cups with the colour set to red, these looked really effective in a dark room. We decorated the cupcakes as Dracula's Castle. We used a slice of Licorice Allsort for the front wall that was trimmed at the top to create a parapet. The wall was then edged by two licorices pieces and topped with two large cachous balls to create castle towers. These are easy to make but you will require icing to hold the elements together. They looked great on the cup cakes. The castle cup cakes were topped with a cup cake topper from our printable range. We also created a blood donation room game for this party, this was a great game that kept the children occupied all evening. This was a fun party and the vampire theme led to lots of great costumes. We have created a small number of printable products for this party, they are available in our shop. 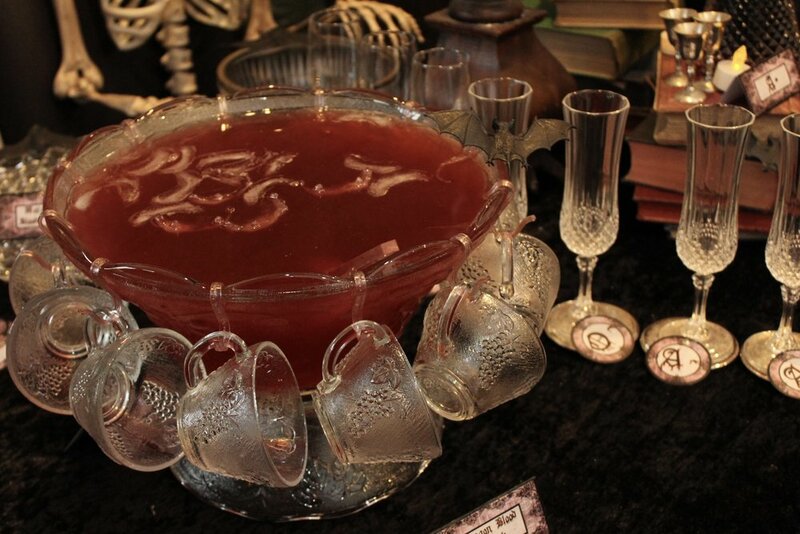 This year we had a vampire themed halloween party so a "Bloody Eyeball Punch" was created. This is a really nice punch enjoyed by young and old, recipe below. See the whole party here. 2 litres good vanilla ice cream. Remove from the heat and add the milk and almond extract. Transfer to a large jug and allow to cool to room temperature, then move to the fridge to chill. When ready to serve, transfer the mixture to the punch bowl. Add food colouring a bit at a time until you reach your desired colour. Add soda, leaving space for the ice cream.